English: Section 3011, Title 10, United States Code. In the center is a Roman cuirass below a vertical unsheathed sword, point up, the pommel resting on the neck opening of the cuirass and a Phrygian cap supported on the sword point, all between on the right an esponton and on the left a musket with fixed bayonet crossed in saltire behind the cuirass and passing under the sword guard. To the right of the cuirass and esponton is a flag of unidentified designs with cords and tassels, on a flagstaff with spearhead, above a cannon barrel, the muzzle end slanting upward behind the cuirass, in front of the drum, with two drumsticks and the fly end of the flag draped over the drumhead; below, but partly in front of the cannon barrel, is a pile of three cannon balls. To the left of the cuirass and musket is a national color of the Revolutionary War period, with cords and tassels, on a flagstaff with spearhead, similarly arranged above a mortar on a carriage, the mortar facing inward and in front of the lower portion of the color and obscuring the lower part of it; below the mortar are two bomb shells placed side by side. Centered above the Phrygian cap is a rattlesnake holding in its mouth a scroll inscribed "This We'll Defend." Centered below the cuirass are the Roman numerals "MDCCLXXVIII." 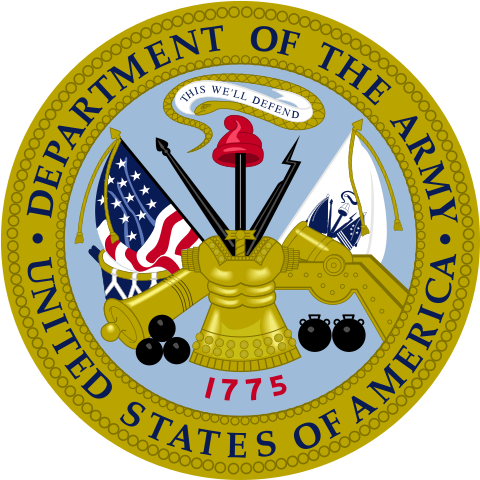 For differences between this text description and the emblem shown above, see "Army Seal vs. Army Emblem", below. The traditional seal used during and since the Revolution was redesignated as the Seal of the Department of the Army by the National Security Act of 1947. The Department of the Army seal is authorized by Section 3011, Title 10, United States Code. The date "MDCCLXXVIII" and the designation "War Office" are indicative of the origin of the seal. The date (1778) refers to the year of its adoption. The term "War Office" used during the Revolution, and for many years afterward, was associated with the Headquarters of the Army. The central element, the Roman cuirass, is a symbol of strength and defense. The sword, esponton (a type of half-pike formerly used by subordinate officers), musket, bayonet, cannon, cannon balls, mortar, and mortar bombs are representative of Army implements. The drum and drumsticks are symbols of public notification of the Army's purpose and intent to serve the Nation and its people. The Phrygian cap (often called the Cap of Liberty) supported on the point of an unsheathed sword and the motto "This We'll Defend" on a scroll held by the rattlesnake is a symbol depicted on some American colonial flags and signifies the Army's constant readiness to defend and preserve the United States. This "War Office" seal continues to be used to this day when legal certification is necessary to authenticate as "official" documents and records of the Department of the Army. The emblem is displayed in color while the seal is not. On the emblem, the American flag is on its own right (observers left) to reflect the current custom for display of flags. The Army flag pattern has been added to the other flag. The Roman numerals "MDCCLXXVIII" which indicate the date the Army seal was adopted, were replaced with the date "1775" to reflect the date the Army was established.